Will Type For Food: Get sloshed with Jane Austen! Get sloshed with Jane Austen! People who make it their business to poke into the private correspondence and novels of long dead (or sometimes, if they're lucky, very much alive) writers all agree: Jane Austen liked beer. Jane Austen liked spruce beer in particular, which is a type of beer you make from boiling the tips from a spruce tree in water or beer wort or some type of wine must, and then adding yeast. (Just like any other beer or wine, basically, but with added spruce.) 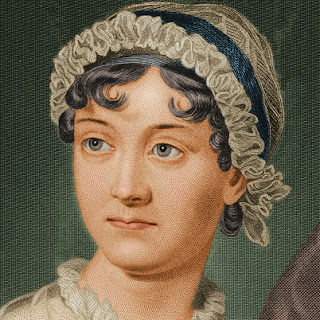 "It is you, however, in this instance, that have the little children, and I that have the great cask, for we are brewing spruce beer again" writes Jane Austen to her sister Cassandra. Note the "again". So she brewed it all the time. And "the great cask". Not sure how much a cask is, but I'm sure it's lots. Geeze, Austen must have gargled the stuff down every minute of the day. And plus some character gives some other character a recipe for spruce beer in some book or other that she wrote, which is clearly extraordinary evidence in favour of my general argument that Jane Austen was an absolute alco who played fast and loose with the juice of the spruce. Sounds like fun. So I decided to make some spruce beer myself; I used a variation of the recipe given on the Jane Austen Centre website. That recipe was itself taken from the British Army (and a very similar recipe is given by others, for instance, Benjamin Franklin). The Baron and I harvested fresh spruce tips from my mother-in-law's tree in Bright, and fresh molasses, er, jars from the shelves of a nearby IGA, and I modified the recipe down for 1 gallon (between 4 and 5 litres) rather than 5 gallons. 2. Add the Goldings hops at the end of the boil. Stir in the molasses. Bring down the temperature of the water to 20 degrees (I do this by immersing it in a tub of cold water, preferably in a sink with a leaky plug so the water runs out as it warms up) (Alternatively you could just leave it to cool overnight). 3. Make a yeast starter - put the yeast in a clean jar with some lukewarm fresh water (I use tank water so as not to worry the yeast with additives in tap water). When the beer wort temperature is 20 degrees to 16 degrees celsius, add the yeast to the bottom of a fermenter and pour the wort in on top of it. 4. Put in a 20 degree room and leave to ferment for a week or so. 1. Chuck the grains in a blender and crack them all open, and then mash them in a little bit of water at 68 degrees celsius for an hour and a half to get the sweet malt out. When done, drain the wort from the grains and wash them with 77 degree water until you have about 8/9 litres of wort. 2. Bring the wort to a boil. Add the spruce and the Hallertau hops. Again it'll boil down a bit over the hour. If I was doing this again today I'd probably add another hit of hops right at the end to get a bit of that nice hoppy aroma. A teaspoon of Saaz, maybe, though I'm open to suggestions as to other good witbier hops. 3. Bring the wort to a temp at or below 20 degree celsius (as above), make a yeast starter (as above), and pour the yeast into the bottom of your fermenter before pouring the wort in after it. Pop a bubbelator on the top and let them get to know one another. 4. Leave in a 20 degree room for a week or so! I conclude this scholarly analysis of the significance of spruce beer in the art and literature of Jane Austen by offering a picture of the author herself. Who would have guessed she'd be such a dipsomaniac, eh?